An eye-catching and unique form of entertainment, our street dancers will have you staring in awe at their moves. Providing an eclectic mash-up of dance styles, these street dancers are a unique form of party entertainment. Combining breakdance, traditional dance, Jackson-esque moves and contemporary styles, they work together to produce a visually stunning set. There are a number of dancers, and the number you book is up to you, but they can achieve different effects depending on who and how many you book. You can also pick the music, so it'll be to your tastes, and you can show your guests something a bit different. 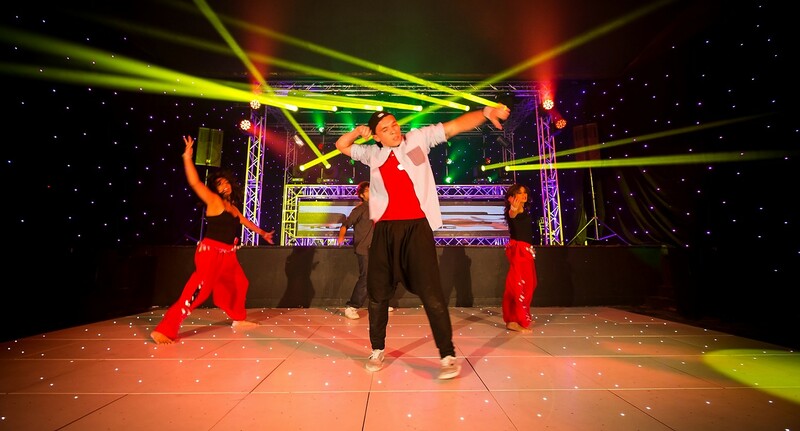 Perfect for big events, these street dancers can easily be the highlight of the evening's entertainment or part of a programme of entertainment. Their skilled moves will have you watching in awe, and probably feeling slightly jealous too. Choosing the right party entertainment can be tricky, and this is something a bit out of the ordinary for some. Dance has always been a central part of celebration, and these street dancers showcase the most up-to-date moves and if anything, give your guests something to aspire to! To discuss your options, or to make a booking, don't hesitate to give us a call. With a skilled set of dancers like these, they'll be sure to have your guests talking about it for days after. Why not book a Kudos Street Dancers for your wedding or event today! Contact the sales team to see how we can find the perfect entertainment for you.